Cucumber is a long, thin, green-skinned fruit with a pale green watery flesh, usually eaten raw in salads or pickled. It can also be used to make soup. 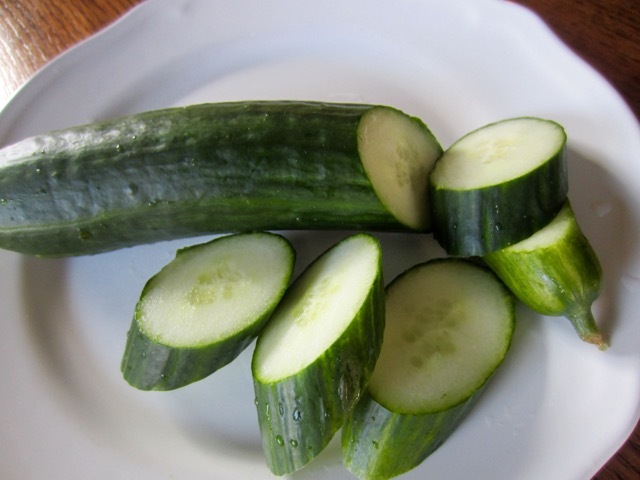 Cucumbers are crisp, cool and moist because they have a very high water content (96%). Although they are mostly used for salads and low calorie sandwiches, they can also be cooked and eaten as a vegetable or as a soup. Cucumber belongs to the family Cucurbitaceae together with pumpkin, watermelon, zucchini and all the winter and summer squashes. 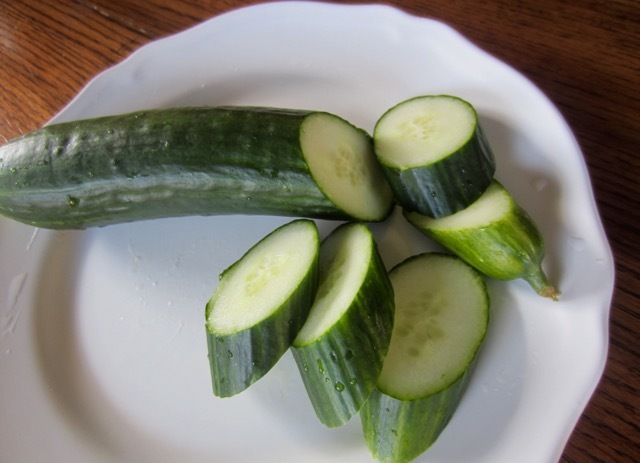 Cucumbers grow in a wide variety of shapes and sizes from the 1-inch long ones sold as gherkins to greenhouse varieties that can grow up to 20 inches (50cm) long. They can have thick or thin skins and can either have seeds or be seedless. There are two basic types of cucumbers. The ones eaten fresh are called slicing cucumbers and the smaller ones like gherkins are grown for pickling. Slicing cucumbers can either be field grown or greenhouse grown. Field cucumbers are also known as garden cucumbers. They are usually 6-9 inches long with a glossy dark green skin and tapering ends.The skin is usually waxed to give them a longer shelf life. They tend to have little bumps on their skin and are thicker than green house grown varieties. They have a crisp white flesh and edible seeds. 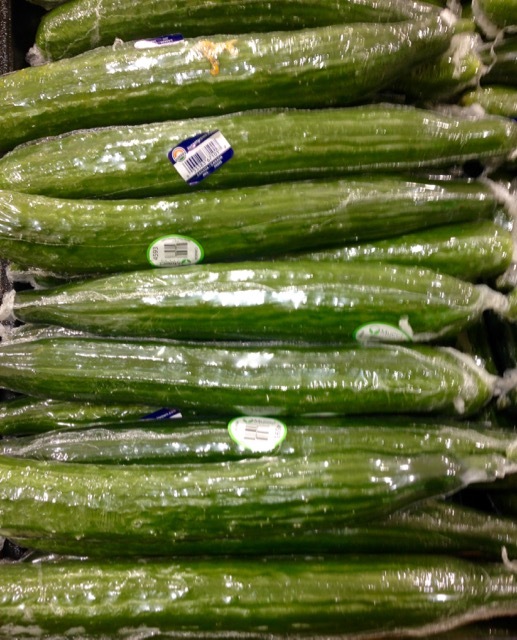 Field cucumbers are typically eaten raw but need to be peeled to remove the wax coating. Greenhouse cucumbers originated from Europe. 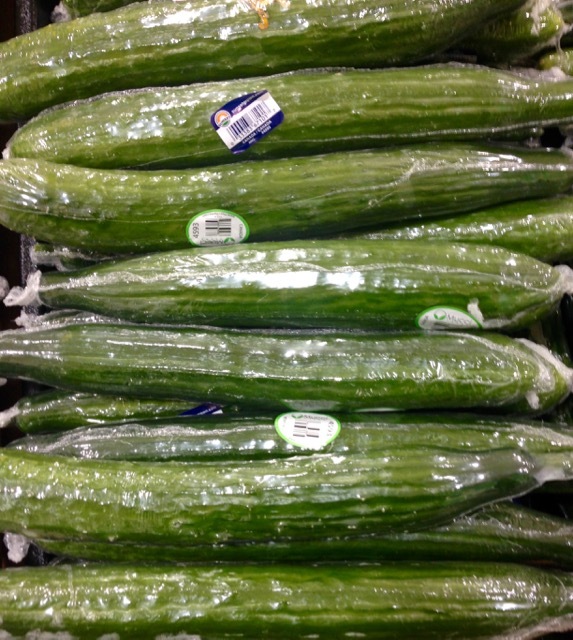 They are marketed as English cucumbers, and tend to be thin, smooth skinned and 1-2 feet (30-60cm) in length. They are either seedless or nearly seedless. They are easier to digest and have a milder taste. They are individually sealed in plastic to protect their delicate dark green exterior and help retain their natural moisture. 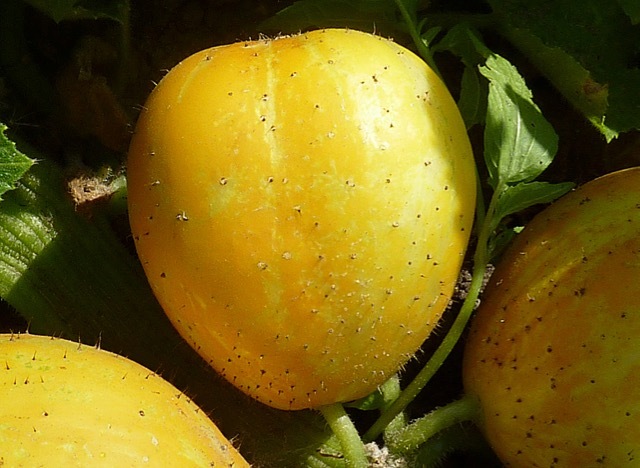 Lemon cucumber: looks like a large lemon with paler greenish yellow skin, that turns golden yellow as it matures. It has a delicate sweet flavour and a crisp texture. 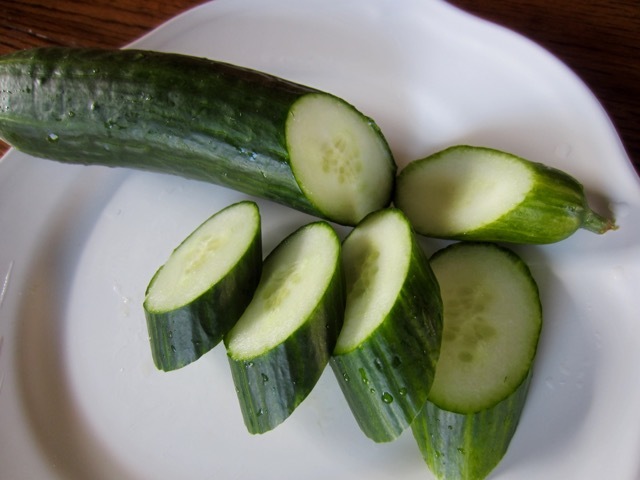 Armenian Cucumber: have a pale green skin, curled tips and soft seeds. 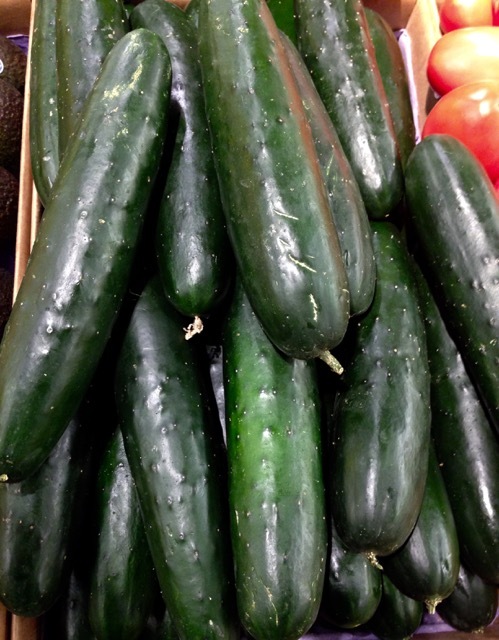 Sfran cucumber: compact cucumbers from the Persian Gulf. Japanese cucumber: these are long and slender with warty bumps on the skin. Pickling cucumbers are generally smaller, squatter with bumpy light green skin. Most of them are processed into pickles. Pickled cucumbers are packaged in flavoured vinegar. The vinegar can be flavoured with tarragon, pepper, dill, thyme, bay leaves, nasturtium buds or small onions. It’s a variety of cucumber, with smaller fruits, harvested while still unripe and used for pickling. They are served as a side, usually accompanying many dishes. In the UK it accompanies fish and chips. Dill pickles can be breaded or battered and deep fried. 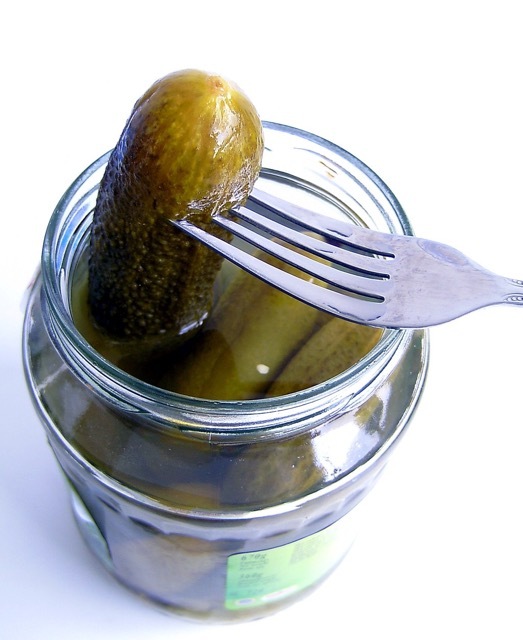 Kirby is used to make commercial dill pickles but is also sold fresh and unwaxed. The fresh Kirbies have a thin skin, crisp flesh and tiny seeds. Cucumbers are very low in calories. A cup of sliced cucumber contains 14 calories and is a good source of Vitamin C.
As mentioned slicing cucumbers are mainly used for salads, salsas and sandwiches. Sliced chopped or grated cucumber is often dressed with yoghurt and a little lemon or vinegar in Indian raita, Turkish cacik and Greek tsatsiki. Slices of cucumber and lemon are popularly added to pitchers of water to add flavour to drinking water. Cucumber can also be made into soup (cream of cucumber soup). Gherkins are mainly used as a condiment or accompaniment. They can also be used as an ingredient in sauces or in salads. Cucumbers are available all the year round but are at their best from May through to July. In fall and winter months they are supplemented with imports form Mexico. Difference between Pickle and Gherkin. Cucumbers for pickling: they are not all alike. Next What is Szechuan (Sichuan) Peppercorn? I grow cucumbers on my back deck and always have lots to eat in late summer, early fall. I love cucumber sandwiches, sliced with pepper and mayo! I just had chilled cucumber and apple soup today. So good!